The UL-certified SMA Sunny TriPower 12000TL-US-10 12kW Solar Inverter is designed to meet American requirements for mid to large-scale decentralized PV systems. With a peak efficiency above 98 percent, OptiTrac Global Peak shade management, and a DC input voltage range of up to 1000 volts, this three-phase, transformerless PV inverter has everything needed to ensure high efficiency. Integrated arc fault detection is included for safety and code-compliance. 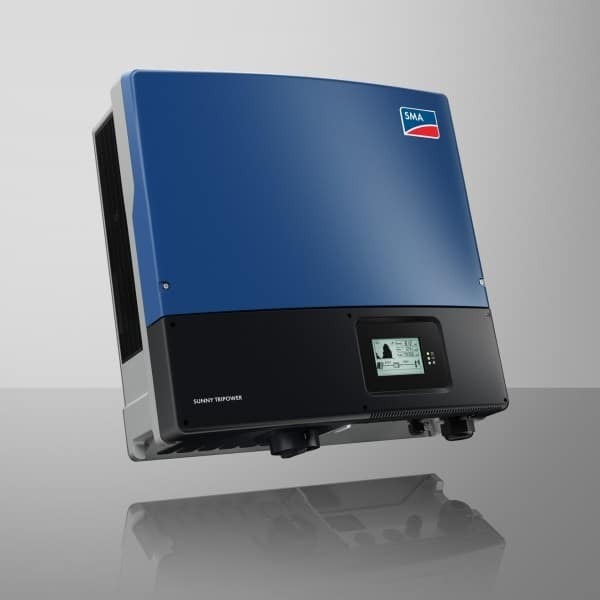 Equipped with two independent MPP trackers, the SMA Sunny TriPower 12000TL-US-10 12kW Solar Inverter can be used in applications with input voltages up to 1000 volts, offering enormous flexibility in the design of a PV system. Grid management functions and cutting-edge communication and monitoring technology are included as standard. SMA from its headquarters in Kassel, Germany, is the world’s largest producer of solar inverters and monitoring systems for photovoltaic applications. As market leader for solar inverters SMA is setting benchmarks again and again. The leading-edge efficiencies of 98% and new technology ensures maximum yields and the highest user convenience. While SMA inverters are designed in Germany, the Sunny Central, the Sunny Island, and SMA SunnyBoy inverters in the 3 kW to 7 kW range are assembled in their new plant in Denver, Colorado. These inverters qualify for the ARRA recovery act and are UL and cUL listed. SMA launched its own SMA solar academy in Rocklin, California, in April 2011. Their Solar Academy is equipped with the latest high-tech teaching tools and demonstration inverters to complement its comprehensive range of courses on photovoltaics and SMA products. Join our ZERO Home Bills Community. BEST Products from the BEST Brands at BEST Prices for ZERO Home Bills on ZEROhomebills.com by Solaranna.